The decision comes after COTA failed to meet its deadline to submit a human trafficking prevention plan. AUSTIN, Texas — Circuit of The Americas will miss out on at least $20 million from Texas's Major Event Reimbursement Programs after Gov. Greg Abbott's office turned down the group's application for the 2018 Formula One race due to a state-mandated deadline. The decision comes after COTA failed to meet its deadline to submit a human trafficking prevention plan, which must be turned in no later than 30 days before an event. In previous years COTA has received $18 to $27 million in reimbursements following the Grand Prix events. "The U.S. Grand Prix is scheduled to begin on October 19th," Director of Economic Development and Tourism Bryan Daniel wrote in an October letter to COTA. "But as you have since acknowledged, no human trafficking prevention plan was submitted until October 3rd." COTA released a statement on Wednesday, saying the anti-trafficking plan was on file for other events throughout the year. 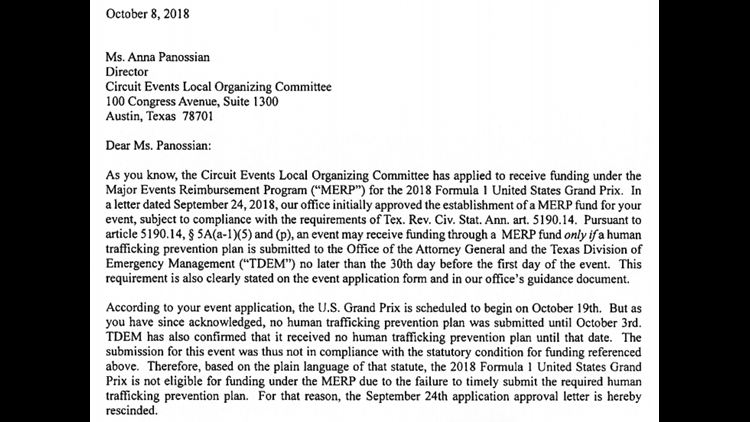 "In April of 2018, the Circuit of The Americas operations team developed a human trafficking plan to be included in the Emergency Action Plan (EAP) for the 2018 MotoGP Grand Prix of the Americas. That plan stayed in place throughout the entire 2018 race season." COTA says it hopes the 2018 issues can still be resolved, as the reimbursement for the 2017 USGP was not paid until 10 months after the event. But Gov. Abbott's office says "the law is clear" and reimbursement funds cannot be issued. "The state of Texas and COTA have a productive partnership that has had a tremendous economic impact on the city of Austin and the state as a whole," says the Governor's press secretary, John Wittman. "Our office is already working with COTA on next year's race."